“No winter lasts forever . . . Here is a look at my cottage style buffet in the dining room. I brought in my old windowpane mirror and hung a daisy wreath from it with some jute cord. Inside the wire cloche is a little white tulip and some speckled eggs. I picked up the cute little bunny this year! I just couldn’t pass him up! This primitive look is a favorite of mine. 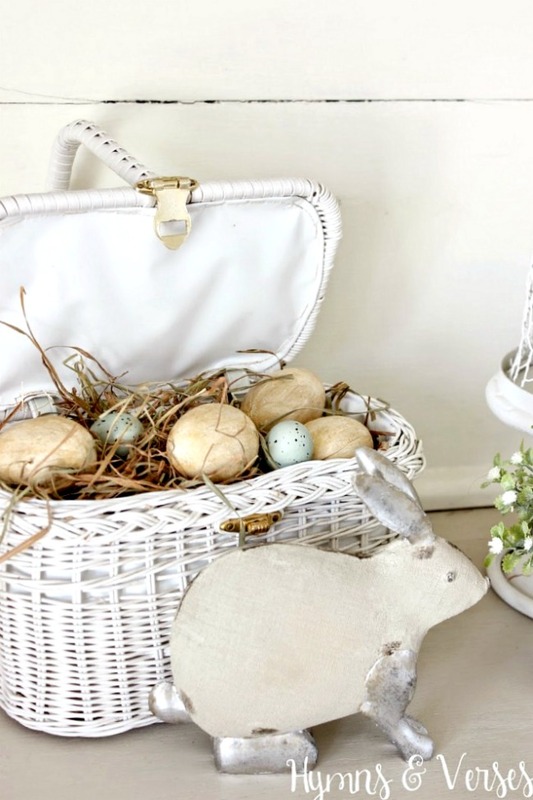 This vintage wicker handbag/purse makes the perfect Easter Basket for this spring vignette! I found it last year a local antique shop. When I saw it, it brought back memories from my childhood when I carried a tiny white wicker handbag on Easter Sunday with little white gloves, white patent leather Mary Jane shoes and, of course, an Easter bonnet! 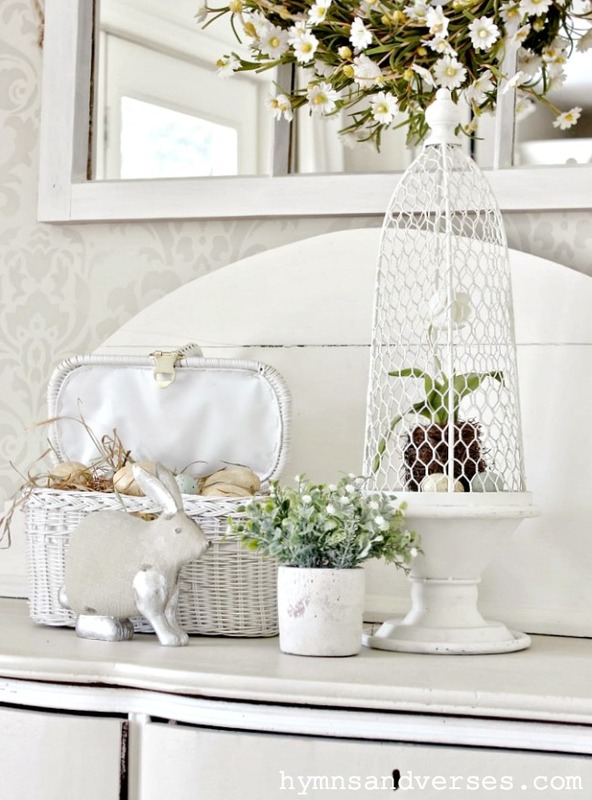 I hope this little spring vignette inspires you to do a little decorating for spring! Because, it really doesn’t matter what the weather is outside – tomorrow IS the first day of spring! 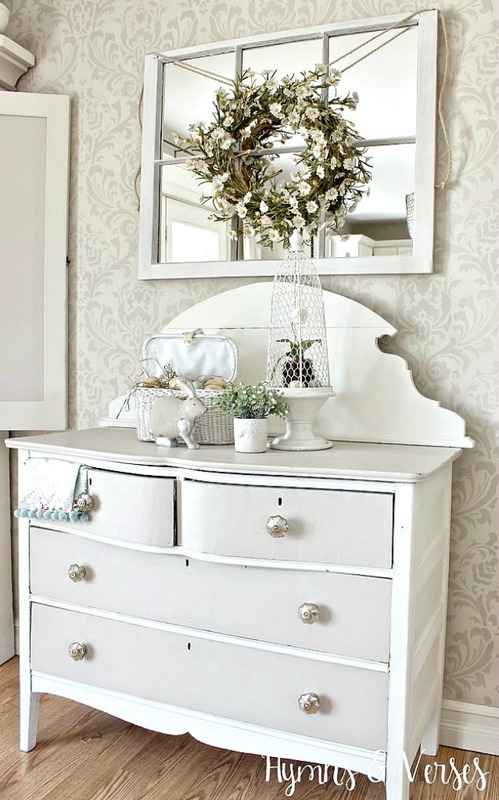 The little, cottage style dresser is one of my favorite makeovers! And, if you haven’t seen how this little dresser looked before, you can see it HERE! The transformation is truly amazing!!! 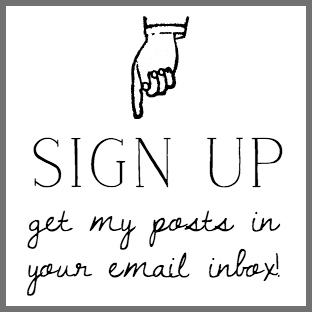 And, if you don’t get my posts in your email inbox, you are missing out! 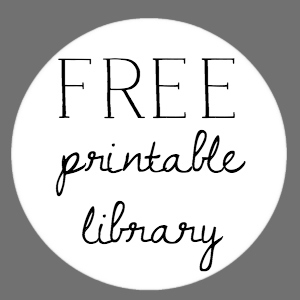 Email subscribers have access to my FREE Printable Library with lots of prints you can download and frame for instant artwork for your home! Click the button below to sign up today! Doreen, That is really pretty! You should enter it in my link up party at Idea Box! I love the colors you chose! Super cute and springy, Doreen. Your Spring/Easter post is beautiful! I love this old dresser and wish I had room for the two I have other than for storage in the basement! The vintage wicker purse is sweet. I remember them too but in natural wicker with brown leather straps. Your whole display is very pretty. Happy Spring to you! Very pretty and Springy, Doreen! Love that little wicker piece. It does make me think of those little pocketbooks little girls carried for Easter when I was growing up. What a comforting thought . . .
"No winter lasts forever . . .
No spring skips it's turn"
I love the wicker handbag!!! What a delightful spring display. 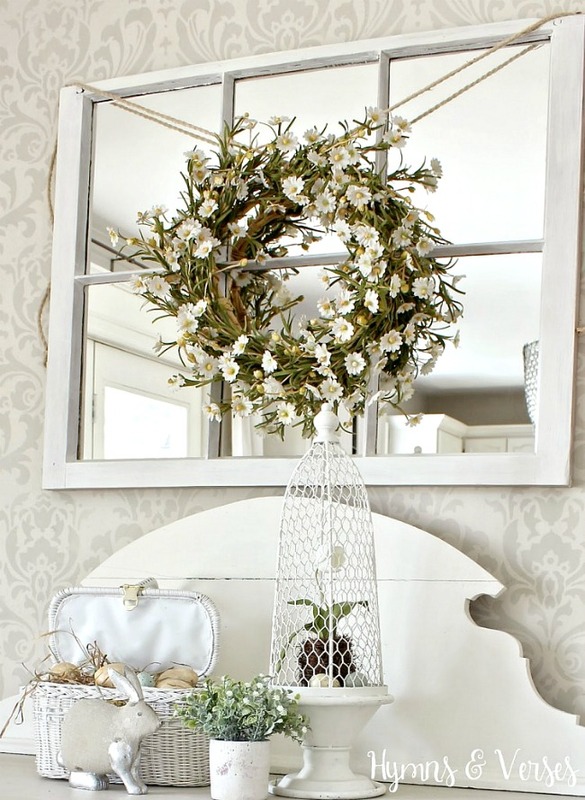 I adore the mirror with the pretty daisy wreath on it – too pretty. 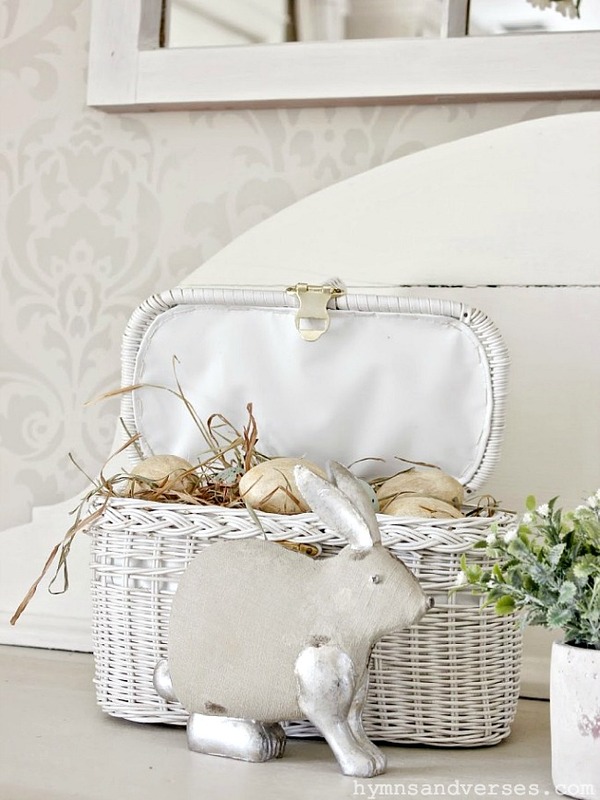 But then you went and added the cute bunny and adorable basket … it's all so perfectly spring! Love it. Your buffet is absolutely gorgeous, dear one!!! Such a 'sweet' vignette atop the dresser!!! Ah~h~h. . .the memories of Easter from one's childhood!!! Mine is mostly the ruffled anklets, white patten shoes and lacey gloves!!! I agree. . .the bunny makes this a seasonably correct vignette!!! 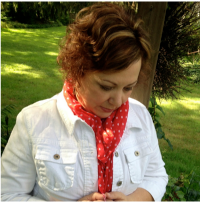 So beautiful, Doreen! Love each item! It is really, really sweet…the purse is a really cute touch! How lovely. Just right for Spring. I love the display especially the bunny and eggs.